Cryptojacking is a way for people to secretly use your computer so they can mine cryptocurreny. This is something that is on the rise and something you should protect yourself against. There are certain sites out there that hide scripts in their code. If you visit a site with one of these scripts in their code it will then start using your computer's CPU to mine cryptocurrency meaning it will become hot, loud and slow. The people at Opera (the web browser) have created a site where you can test your web browser to ensure it is protected. All you need to is visit their site and hit the Start button. The test will then begin and you will see one of 2 messages: Your Protected or You're Not Protected. 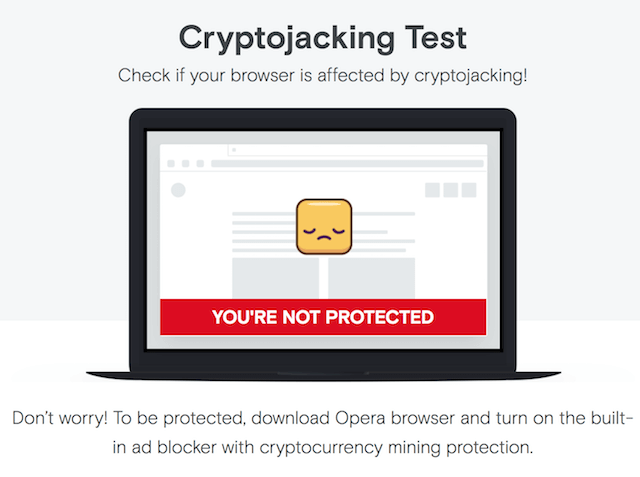 Use a good AntiVirus - Check with your antivirus provider to see if it can detect and block a cryptojacking attack working through your browser.